It’s cold outside, but somehow we still have plants growing inside! Today’s project is a clean and simple 8 ½ x 11” layout of our little pine tree sprout that sits on the windowsill. 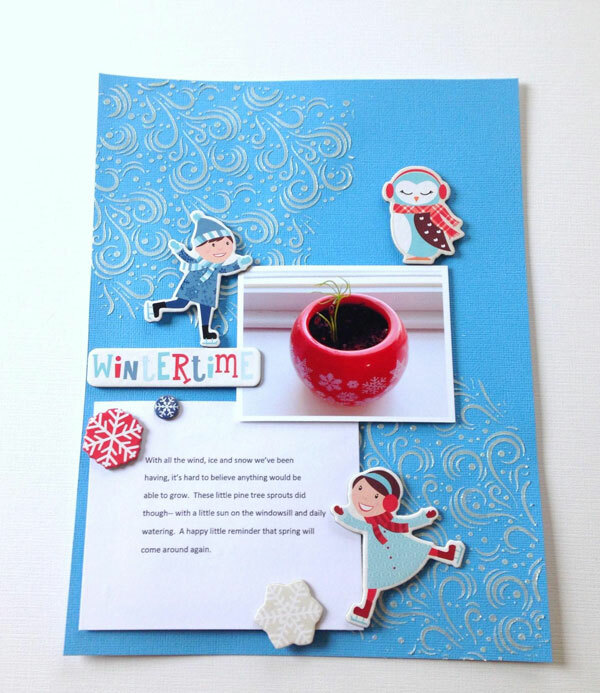 This entry was posted in Paper Crafts, Scrapbooking, Winter and tagged Echo Park, Scrapbook Layout Ideas, Scrapbook Layouts, Scrapbooking Layout, Winter on February 28, 2019 by Heidi. For those of us still stuck in the deep freeze of winter, crafting can be a nice way to spend a cold afternoon. Why not make a few cute greetings for friends and family? 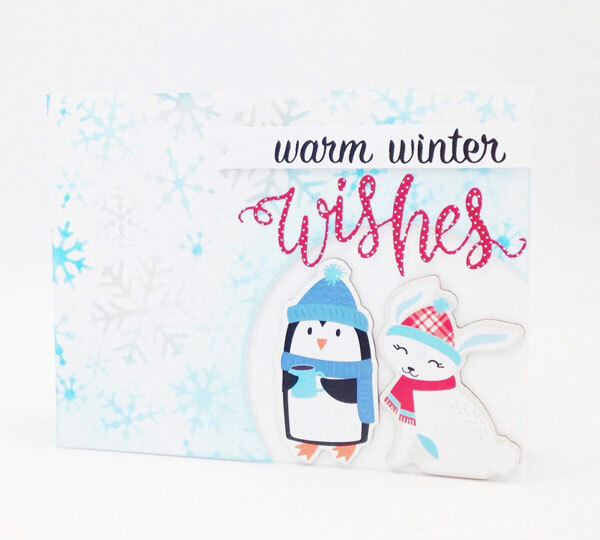 For today’s project, I have a sweet little snow-themed card using some products from Echo Park’s Celebrate Winter collection. This entry was posted in Cardmaking, Paper Crafts, Winter and tagged Card Making, die cuts, Die Cutting, Distress Oxide, Echo Park, Snow, Stencilling, Stencils, Tim Holtz Distress Oxide on February 26, 2019 by Heidi. Make a pretty mobile to decorate your home, and make it cozy for winter. 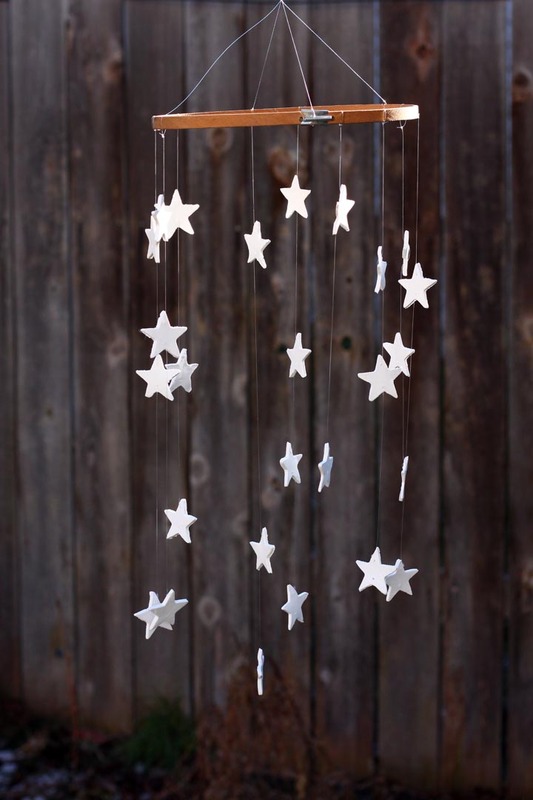 This entry was posted in Crafts, Family Crafts, Winter and tagged Clay Crafts, cookie cutter, kids craft, mobile, Night Sky, Stars on January 9, 2019 by Michelle. While shopping during the holidays, I’ve come across a lot of plaid patterns in kitchen dishes and textiles. I held myself back from starting a collection of plaid coffee cups—they’re so cozy and festive! My card today is inspired by those plaid cups though, and I’m using a really fun set of chipboard shapes from Paper Accents called Cup & Cocoa to create a card with lots of texture. How cute are those little marshmallows? This entry was posted in Cardmaking, Crafts, Winter and tagged Cardmaking, Cocoa, Coffee, Thank You Card on January 6, 2019 by Heidi. When creating projects, sometimes keeping it simple can really pack a punch with the right product. 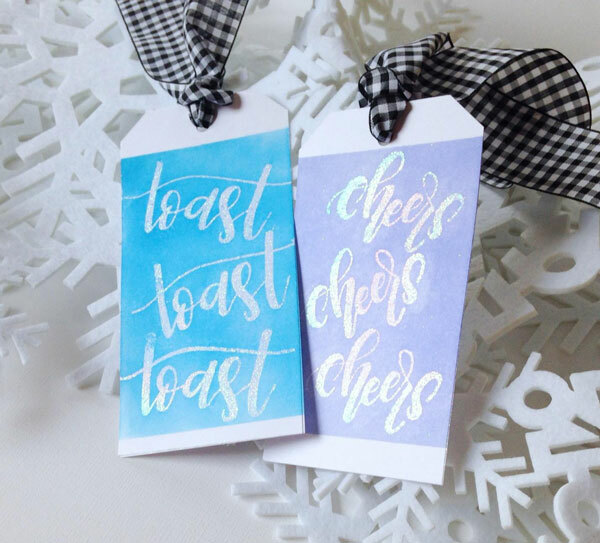 For these easy wine bottle tags, I took a simple design and brought it up a notch using holographic embossing powder and some brush-lettered stamps. This entry was posted in Paper Crafts, Rubber Stamping, Winter and tagged Gift Tags, Heat Embossing, Rubber Stamping, Stamping on December 29, 2018 by Heidi. 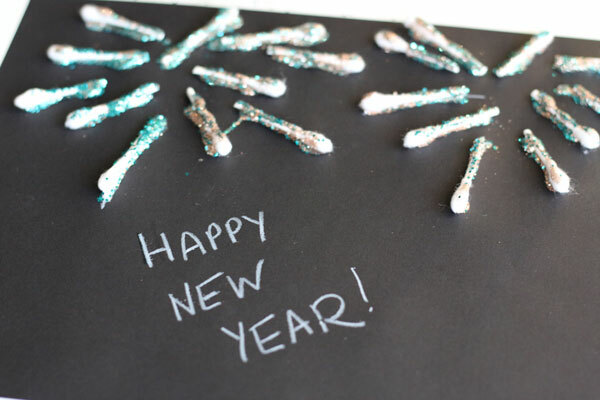 These Sparkly Q-tip Fireworks are simple and fun to make with kids this New Years and look totally 3D! So beautiful! This entry was posted in Kid's Crafts, New Years, Winter and tagged Crafts for Kids, Glitter, kids craft, New Year on December 27, 2018 by Veronika. There is so much to scrapbook during the holiday season and so many products to help you do it! If you’re short on time, but still want to have fun using all the fun supplies you bought, I would recommend trying an 8 ½ by 11 layout. This gives you just enough room to use your products, but on a smaller scale– especially if you just have one picture of a memory you want to capture. This entry was posted in Christmas, Scrapbooking, Winter and tagged Christmas Layout, Holiday Layout, Scrapbooking, Scrapbooking Layout on December 23, 2018 by Heidi.